St. Germain showed up today during a healing with a women who, I didn’t know at the time, is really into metals, welding of metals and alchemy. This is one of his abilities and gifts in helping others, alchemy. He also helps with helping one be comfortable mingling with influential people, courage, direction in life, life purpose, manifesting, perseverance, psychic protection and space clearing. Many people in the spiritual New Age Realm say that St. Germain is the Ascended Master of the Age of Aquarius, the two thousand-year cycle that we are currently living in. He is also the renewer and bringer of the violet fire which can be used for many cleansing, clearing, healing, manifesting and protection properties. What I know of him, from my personal experience, is that he shows up from time to time while I’m teaching my spiritual classes. He lets me know he’s with us usually while I’m setting space. Then he does his work from behind the scenes and I go about teaching feeling renewed energetically knowing he’s with us, supporting us and bringing his great knowledge to the group. During my session today he wanted to remind us to work with the violet flame for protecting our Auric field and making this a DAILY visualization process. Here is what he showed me. As always, work with it to make it FEEL right to you. There is no wrong. Hands in prayer position, bring in your Reiki, your Reiki guides and ask for St. Germain to be with you during this process. Visualize or imagine a large violet flame in the form of a lotus flower on the floor in front of you. Imagine the violet lotus rising up and surrounding you and your Auric field providing you with powerful spiritual protection. Imagine this violet energy rising up to Divine and being ONE with Divine energy. Imagine the Violet lotus with a root going down and grounding you to Mother Earth. Allow all Love and Light, all good things to come and go through the violet flame petals and can get to you. Visualize all ‘old’, lower energy or drama, to move down into the violet flames below you and be transmuted into useful energy once again. Old energy does not get to you or get into your energy field. This visualization mixes well with the 5 minute daily meditation I recommend for people who dont’ want to pick up other people’s energies or have their energy taken by others. The Violet Flame has very powerful vibrational healing qualities. Try this visualization and see how it feels to you. If you like it and want to read more about St. Germain simply google him. There is a lot of information about him and I don’t want to guide you in any particular direction but allow you to be guided by your Highest Guidance as to which information is correct for you to read. Hummingbird Reiki – Reiki That ANYONE Has Time For!! I teach in Reiki I that there is no wrong way to do Reiki. IT’S ALL GOOD!! JUST DO IT!! Are some of my favorite ‘catch’ phrases. If we make a ‘mistake’ while doing Reiki, we can always learn something from it, and therefore, it was not a mistake. However, even by NOT doing Reiki we are learning how we feel when we do not do it. This doesn’t work as well if the person doesn’t practice Reiki from the start though, because they never get a chance to feel how good it feels while actually doing Reiki practice. So, it is my focus as a teacher to motivate my students to DO daily Reiki, every day for the first month after their class, both to create the habit, but also so they can FEEL a difference that Reiki makes in their lives. I have seen this work quite well with many people. However, everyone is different and there are many different reasons people stop practicing their Reiki. Each person is an individual, it helps a lot if I can have a one on one session with them to FEEl in them, why they are not being successful with their Reiki practice. This was the case with my client, Nancy. My client, Nancy, has been coming to me for Reiki sessions for over a year for pain in her body and stress relief. She also became a student of Reiki and has come to some Reiki Circles so she could work on herself in between our sessions. She felt an extreme difference in the beginning when she did Reiki on herself every day and had mini-miracles happening in her life on a weekly basis. 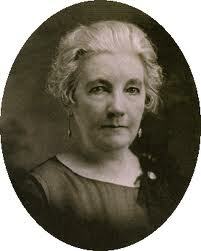 Then, she hit her busy season and stopped her daily Reiki practice. 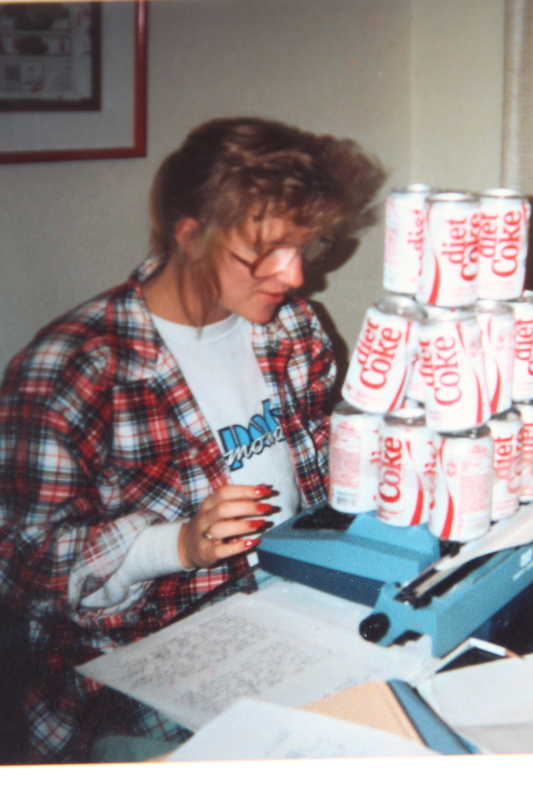 Nancy owns her own business and works very hard at it and loves it. But, often times, she finds herself working too much at a job that is very physical and hard on her body. Reiki and meditation help her to support her body while keeping up a challenging schedule. Even hummingbirds sit and rest now and then. Simple, remember that you can do Reiki in little bits that fit into your life and your schedule. Instead of doing all the hand positions like in a 30 minute self treatment, just do one or two of the most important areas. Trust your intuition on where you need it most in that moment and do it. REMEMBERING to do it and start this habit may be the most difficult part. Do what you need to do, to keep Reiki in the forefront of your mind while creating this new habit. A string or rubber band around the wrist is a good reminder and an easy one for at least the first month or until you feel the habit has been engrained within your subconscious. Reiki on yourself while posting on Facebook. Just let it flow. Reiki beamed at yourself from your hands resting on your lap while waiting for a client or prospect to come in. A very subtle way to do Reiki on yourself in public places. Reiki yourself while waiting at your table for your food to be brought out. Reiki on yourself while you have a 15 minute break at work. Reiki while on hold waiting for a customer service rep. Chances are you’ll need to be very calm by the time they come on the phone. We have endless amounts of bits of time in between our busy moments where we can do 5 minute or less Reiki on ourselves. ITS ALL GOOD!! Even five minutes, built up here and there, can do a lot. “Any Reiki is better than no Reiki at all! !” Josslyn Streett, just said that!! 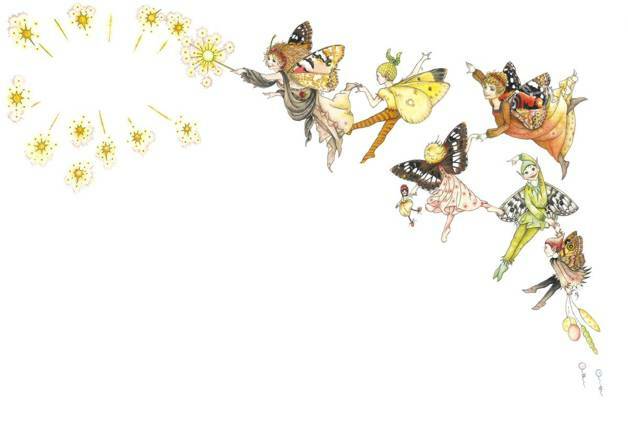 Remember, if it truly is ALL GOOD and we truly can do NO WRONG, then what you can do with your Reiki ability is endless. If you have other ideas on how to do some Hummingbird Reiki or have examples of how you HAVE done this, please share with us here in the comments section. We all learn from each other. Many Reiki Blessings to Nancy for allowing me to share her story and to all of you for reading, commenting and DOING REIKI!! Even the smallest actions towards Love and Light are powerful!! Congratulations to 6 New Reiki I Students!!! 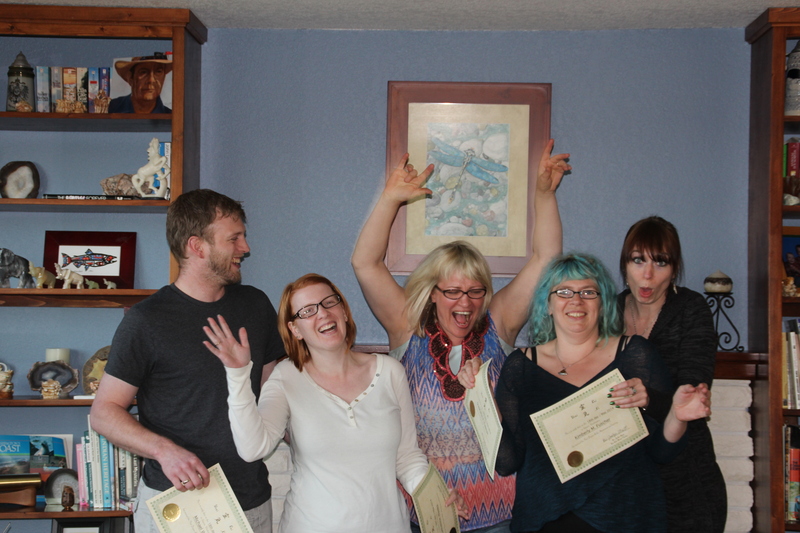 I’d like to say a big CONGRATULATIONS to my recent beginning Reiki I class. Each class comes together for a reason that usually becomes clear during the process of the class through sharing and healing. 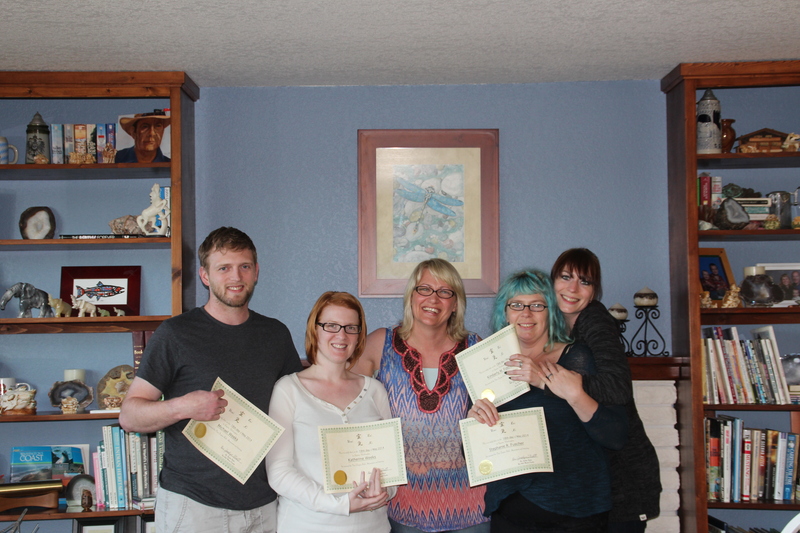 May 2014 Reiki I class (minus two camera-shy) CONGRATULATIONS TO Katie, Michael, Kimberly, Stephanie, Chris and Linda. One of the themes for this class was clear before we even started, the love of family. Two of my own cousins, who also happen to be husband in wife, were students in the class as well as two sisters and a student who is related to another of my students. The love in the room was palpable and it affected each of us in very spiritual and emotional ways. 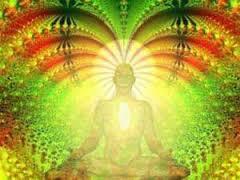 I felt the energy very powerfully, especially during the attunements and the practice healing. One of the other themes that brought this class united was all of our interest in spiritual guides, also called Spirit Guides, Reiki Guides, and many other names. The whole group really woke up and had a ton of questions when it came to this topic so we spent a lot of extra time talking about and explaining techniques in working with one’s Reiki guides. This is not a normal part of original Reiki class, but it is in my opinion a very important part of doing any spiritual work, including Reiki. And, the more we practice our Reiki, the more chances we have to expand out ability to work with our guides. In Reiki I class we do a meditation to introduce us to our guides. 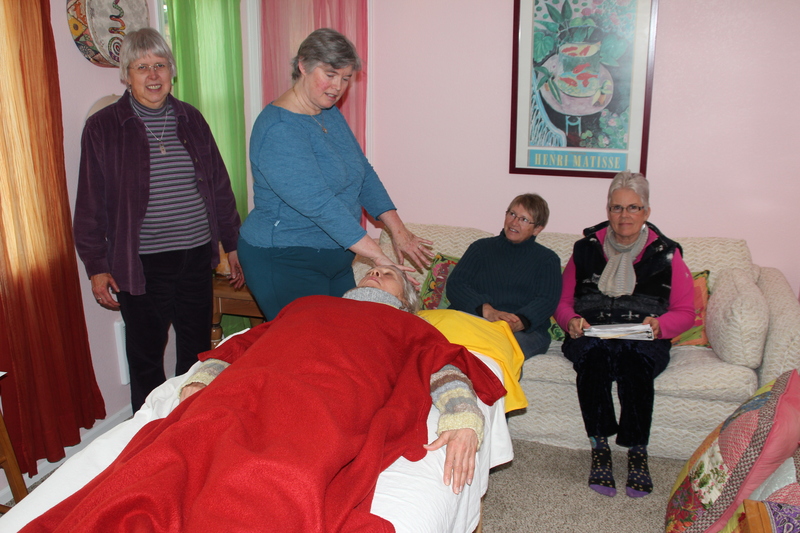 If the group shows special interest like this one, I teach a special technique that I created for myself years ago to make sure we bring in the Highest and most Enlightened source of Reiki Guides only. We only want to work with the best of the best to get the Highest Form of information. This is also one of the benefits to the two-day Reiki I class, we have the time to expand on the subjects that interest each class the most. Each class is so unique, I’m so immensely grateful for being able to do this work, and personalize it too. To all Reiki students, a reminder, Reiki class only gives you the tools to do Reiki, it is up to you to USE THE TOOLS GIVEN TO YOU! DO your Reiki every day and you WILL see changes. You will grow spiritually and heal physically, emotionally and mentally. It is your choice. Your free will. 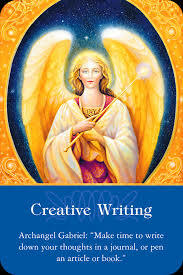 Please note, message from our Divine Creator and my guides: Divine has been telling me for a while, but a whole lot more since the major shift in our energy state at the beginning of the new cycle, that it is time to be working in small, local, spiritual groups. Working in groups of like-minded people helps us to move forward on our healing path and spiritual journey more quickly and more easily. It also makes it a more spiritually fulfilling life and experience. THIS blog, although you may not think so, is a message for YOU. It is time to make our spiritual lives our NUMBER ONE PRIORITY!! It is time to drop activities that are not fulfilling our souls, and add activities that are. This will help to make us feel whole again, and truly get us on our soul path. If you are not manifesting a spiritual group to be a part of, not starting one of your own, then it is time to do so. Make a list of what kind of group you are looking for. Be specific for what you want, down to how far you want to drive to get there. What kind of people will be in the group. How you will FEEL when you are a part of this group, etc. Reiki the list or pray over it daily. Change it as need be. Feel LOVE IN YOUR HEART as you manifest this group. Then DO. Look through the newspapers and local bulletin boards and talk to friends and family who are open to spiritual beliefs, because you never know where you are going to get the message about your perfect group. Aunt Bea says “Oh, I heard about a new meditation group starting by your house on Wednesdays.” BINGO!! Be open to the possibilities that you WILL FIND the perfect spiritual group for you and you will. Since I moved to Sequim, WA 5 1/2 years ago and started teaching Reiki here shortly after, I have had the goal of the healers on the Olympic Peninsula coming together as one. There are many great healers here doing important healing work. But, we all seem to be doing it by ourselves, in our own way. This has worked for me due to the fact that my main job is mom and my time is defined by mom duties, like taxi driver and homework administrator. But, I’ve continued to manifest this group slowly and surely, knowing that when the time was right, Divine would do the big work. I was right. And, the time is right. It is happening easily and effortlessly which is how it happens when we allow Divine to do most of the work. I’ve been a part of another healer’s group for about a year. The group has gone through many changes in the last two years. It was a group specifically for Energy Psychology, but now it is focused on all different types of energy healing. Anyone interested in doing energy healing and alternative healing on the Olympic Peninsula is welcome to come, learn and share. We all take turns in teaching some new method of energy healing each month. We meet from 9 am to 11 am on the third Friday of each month. Contact Penny Burdick at mandalaht@gmail.com if you are local and you’d like more information about attending a meeting. April’s meeting will be at my home and I will be teaching about healing with crystals. A Back Chakra Activation demonstration by Mary Ellen Bartholomew. This month, three of the healers who had taken a class in Back Chakra Activation shared some of what they leaned and how it can be used in a healing practice. It was so motivating to me I’ll be signing up to take this class in June myself. I felt it was a worthwhile technique to learn and share. This class information was downloaded to the teacher, Franny Harcey, an experienced Healing Touch Certified Practitioner and Registered Psychotherapist, over a period of many years. She has now written it up into a class. Her guides even told her which states and areas she was to focus on first for teaching this class. They were very specific. Back Chakra Activation helps specifically with anxiety, PTSD, depression, chronic illness, fatigue, and acute pain. It also provides energetic support of the body for integrating the connection of front and back chakras. the back side of the chakra system is of key importance to unlocking the unconscious, opening to alternate realities, and embracing our dreams, premonitions and beliefs. If you would like further information on any of these healings or activities you can contact me at rainshadowreiki@gmail.com .